Listed in Best Books 2015 @ Times Higher Education. ‘Young presents a brilliant account of how the voice has been preserved, transformed and even imagined in relation to technology. The 13-page list of electro-vocal pieces alone is a superb resource.’ – Dr Elizabeth Dobson for Times Higher Education. ‘Young provides a necessary exchange between scholarly knowledge and creative practice…. what is voice, what is it? The book insightfully and imaginatively highlights this critical question by cutting, repeating, scratching, and reassembling it. 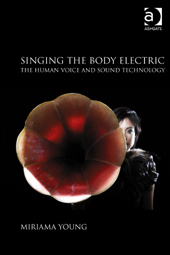 It indeed sings the body electric through its conversations.’ – Dr Zeynep Bulut in Twentieth-Century Music.